Wear a shirt that literally rips & breaks through everyone's attention. 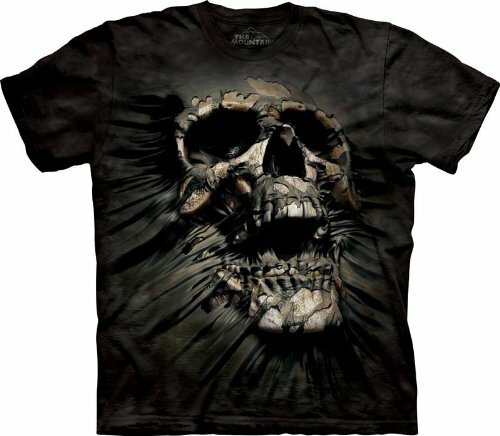 Breakthrough Skull T-Shirt by The Mountain Description 3-D Breakthrough Skull Tee T Shirt Ripping [Adult Medium] by The Mountain. Wear a shirt that literally rips & breaks through everyone's attention. After just one wash you will not know where the print ends and the shirt begins. Our unique printing process actually pulls the dye color out of the shirt and leaves the ink color behind, essentially dyeing the cotton with the ink. The Mountain Classic T-shirt features an over-sized relaxed fit, with reinforced double-stitching on all seams. After dyeing they are washed and dried, so they arrive to you comfortable, pre-shrunk & ready to wear. This heavyweight 100% Cotton tee will last you years and years.